To some people dreams are just the electricity running through our brains as we sleep and mean absolutely nothing. Some believe it's just a combination of something spicy you ate, and eating too close to bedtime, or they're induced by the medicine you're taking. To others they provide guidance and insight into life. Some believe they provide visions, or visitations from people who've crossed over into the after life. For me, I believe they can be any of those. Just over a year ago, a friend of mine, who I only know from the Facebook group we both were in when we had loved ones in the same military unit, sent me a message. She felt a bit awkward about this message, and how it would be received. We do not know each other, really. She had had a recurring dream about me, and felt I needed to hear it. At this time of life, my mother had entered hospice care. The brain tumor had grown too far, and it was clear she was losing her battle. It was only a matter of weeks at this point. I was mourning her impending end of life, and was terrified to go through the grief I knew I'd have to soon. Grief doesn't just make me sad, it tears me apart. It wrecks my health, it wrecks my ability to function normally. I lose my ability to care about relationships, and activities I once loved, and I sink into depression. I don't just get sad. I get sick. Grief actually makes me very sick. I was scared. I couldn't imagine life without my mom, but I was terrified for what would happen to me afterward. What kind of shell of a person would be waiting on the other side of this mountain? “I dreamed that we were on a stage -- like a movie set -- but no one else was there but you, me and my daughter. We were standing near a ladder tower – the kind that connect scaffolding. We were talking about everyday stuff, chit-chatting. My daughter screamed, and we turned to see a HUGE Bengal tiger walking through the door, toward us. I grabbed my daughter’s hand and pulled her up the ladder onto the scaffolding. We were yelling for you to join us, to climb up and be safe. It occurred to me while we were up there that wild cats can climb, so we weren’t as safe as I thought at first. We kept yelling for you, screaming in fact, but you were standing there, one hand on the tower, leaning slightly for support, frozen. You were staring down the tiger as she approached closer and closer. It seemed like you were scared to death, but determined to not flinch. You came face to face with the tiger, her emitting a low, throaty growl and you, tears sliding down, staring her down, almost trying to communicate empathically. The dream was so symbolic of what I’ve already faced and what I'm facing this year, and the fact that I was staring it down, immovable, even though terrified, meant that I am strong, and I will get through these days that keep me on my knees begging God & his angels to lighten my load. It's been exactly one year since she left us. I can't believe it's been that long since I saw her last. It feels like forever that she's been gone, and like she's never been gone all at the same time. I am wounded, I am scarred, and there are some wounds that just won't heal, yet. 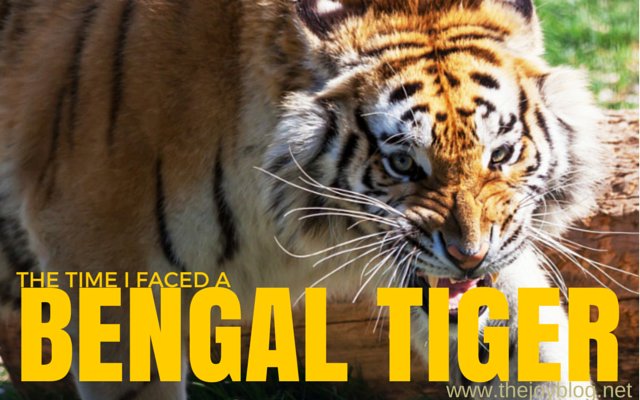 All I know for sure is this: I faced a Bengal Tiger, and I SURVIVED. And THAT is an incredible realization.